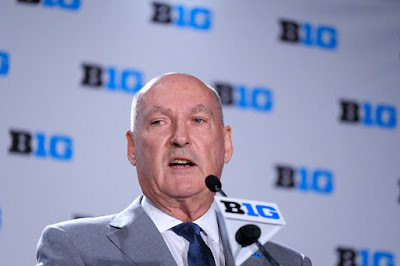 ROSEMONT, Ill.— With the college basketball season around the corner, commissioner Jim Delany addressed numerous topics at Thursday’s Big Ten media day at the Hyatt Place O’Hare. The ongoing college basketball corruption trial dominated the conversation and Delany recognized how it could leave a black eye on the sport. The debate as to whether players should be paid or not has been discussed for the better part of this decade. Delany addressed how some of the boosters have gotten to some of the freshmen and high school players in terms of improper benefits. The Big Ten will be the first conference in Division I to utilize a 20-game schedule with Purdue-Indiana, Illinois-Northwestern and Michigan-Michigan State designated as rivalry games in which they will play twice on a yearly basis. Despite the expanded schedule, the Big Ten will continue to open play between the last week of November and the first week of December with each team playing two games each. Even with college football playing its conference championships in the same period, Delany sees the potential in having bigger games featured and being able to get some of the spotlight. After moving up a week to play at Madison Square Garden in New York City last season, the Big Ten Tournament returns to their traditional championship week slot as the United Center in Chicago will host the event from March 13-17, 2019. The next four seasons will see the tournament alternate from Chicago and Indianapolis, but Delany sees the possibility of other Midwestern cities, such as Detroit hosting in the future. “After we have a plan after the four-year run, I think it will be open and more competitive. There will be other opportunities for other cities to express interest,” Delany said.